One of the most annoying things about modern life is the misleading information on product packaging, particularly food. 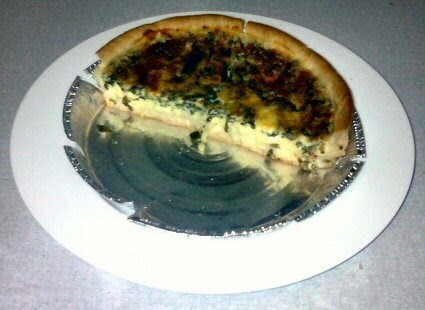 Consider the quiche shown on the plate above. The packaging states "Serves 4". Note that is doesn't say "Feeds 4 adults" because that simply wouldn't be true. Did I mention that the photo above is using a side plate and not a main serving plate? 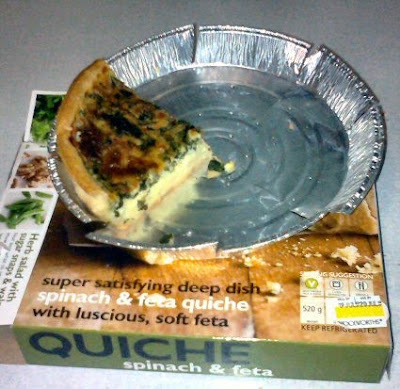 Perhaps it should have said "Serves 4 toddlers" because there is no way on earth that 500g of quiche could ever actually provide a satisfying meal for 4 adults, let alone teenagers. Why do companies lie to us? Clearly the label "serves 4" is intended to tell the gullible shopper that there is enough quiche in the packet to present to a dinner party of 4 guests? If not, then why is it there? To say that you can cut the contents into 4 pieces? That it's too big to put the entire thing in your mouth at once? The mind boggles. We think that you are stupid enough to believe that this tiny packet could actually provide 4 slices to 4 adults and actually pass off as a "serving" even though it clearly does not have enough nutrition for 1 teenager. Of course we think we can get away with it because no sane person would actually complain, and even if they complained we'd just ignore the complaint. We think all our customers are stupid, and this is our subtle little way of misleading them further. Update: The supplier wrote and said "[we] in no way intentionally mislead customers, it is our understanding that most customers who buy this product do so with the intention of serving it with a salad or other side dish". So my question is: how many servings does it take to make a meal ? But it DOES feed 4 adult midgets suffering from a rare eating disorder!